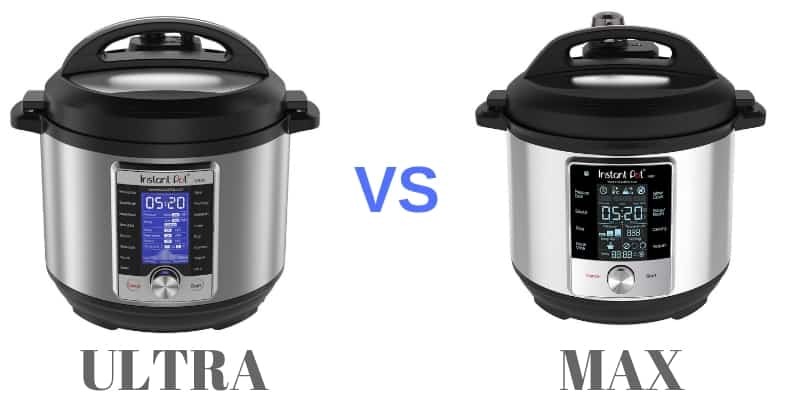 Instant Pot ULTRA 60 vs MAX - Which Model is the Best in 2019? The Instant Pot Ultra and the Instant Pot Max are two of the most versatile Instant Pots available. These two models are also positioned in the high-end of the product line both in terms of features and cost. However, there are a few major differences between the two which we will examine and discuss in this article. If you are searching for a new multi-purpose pressure cooker, you should compare the features, pros, and cons of each option. Here is a direct comparison of Instant Pot Ultra vs Instant Pot Max. Instant Pot Ultra vs. Instant Pot Max: What’s the Difference? Conclusion: Which Instant Pot Is Right for You? There are currently nine different Instant Pots in the popular 6 Quart series. When the Instant Pot Ultra was released, it introduced a couple of new features. It was the first Instant Pot to allow you to choose any temperature instead of selecting a temperature range. The temperature setting is part of the “Ultra” mode. With this feature, users can set the delay timer, pressure level, cooking time, and temperature. The Instant Pot Ultra also includes ten different pre-programmed cooking functions. As the Instant Pot Max is the newer model, it includes a few features not found on the Instant Pot Ultra. The biggest difference is the interface. 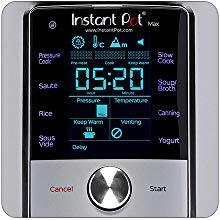 The new Instant Pot Max replaced the confusing control panel with a touchscreen display. Instead of dealing with a bunch of buttons, you can simply select your settings on the touchscreen. The Instant Pot Max also removed many of the pre-programmed cooking functions and does not have an Ultra mode. However, it still provides complete control over the cooking process. You can still set the temperature, cooking time, delay time, elevation setting, and pressure level. The Instant Pot Max also includes a temperature sensor in the lid. The pressure level is another difference between these two models. All previous Instant Pots allowed you to choose between low or high pressure. The high-pressure setting offered about 11.6 psi. With the new Instant Pot Max, you can set the pressure level up to 15 psi using the “max” pressure level setting. With 15 psi, the Instant Pot Max offers a couple of additional functions. You can finally use an Instant Pot for sous vide cooking. You can also use it for canning. Sous vide cooking requires you to cook food in water at a specific temperature. As the Instant Pot Max includes a sensor in the lid, you can get more accurate temperature settings, making it possible to cook sous vide. The Instant Pot Ultra includes the sterilize function, which was not suitable for canning due to the limited pressure level. With the Instant Pot Max, canning is now an option. With a higher pressure level, the Instant Pot Max also works with stovetop pressure cooker recipes. In the past, you needed to adjust the cooking time as stovetop pressure cookers often cook at 15 psi. The Instant Pot Max also provides a more convenient pressure-release button. On the Instant Pot Ultra, the button is next to the pressure valve on the lid. The button on the Instant Pot Max is on the control panel, which makes it safer to operate. The final difference between these two models is the stirring feature. The Instant Pot max added a pulse release function. While it does not technically stir the food, the pulse release function can agitate the food. All the above new specs and features of the Max are as described and presented by the manufacturer. However, don’t take anything for granted if you don’t try it yourself. Unfortunately, many users online who have used both cookers, claim that the IP Max model does not stand up well to all the features advertised. Many people claim that the sous vide function takes too long to reach its temperature and also that the extra pressure power (15 psi) of the Max model does not cook faster than the Ultra. Basically the Max model is much more expensive without being any better than the Ultra model. With the Instant Pot Ultra, you can set the cooking time, pressure level, delay timer, and temperature before cooking. If you do not want to choose these settings, you can start cooking by selecting one of the pre-programmed cooking modes. The cooking modes are selected using the spin dial control, which is below the large LCD display. You can easily view the remaining cooking time and current settings on the backlit display. While these features are useful, some people find the spin dial control difficult to operate. However, this is one of the few drawbacks. Overall, the Ultra is a convenient multi-cooker. It includes everything offered by earlier Instant Pots and added the ability to customize all the settings. 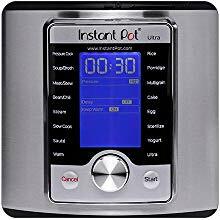 As you can see from Amazon reviews above, the Ultra is one of the best rated appliances in the Instant Pot product line with some raving reviews. New higher pressure setting (15 psi) similar to stove top cookers. The new pressure setting is one of the biggest differences between the Instant Pot Max and previous Instant Pot models. As mentioned, you now have a “max” pressure setting instead of just the high and low settings. You can set the pressure level up to 15 psi. The Instant Pot Max is the first Instant Pot that you can use for canning and sous vide cooking. Previous models did not offer the required temperature and pressure needed to effectively kill bacteria for canning. They also lacked the precise temperature control needed for sous vide cooking (although people claim that it does not keep the exact temperature as the one you set it for). The Ultra and Max are top-of-the-line products in the IP series. Either Instant Pot can be a wonderful addition to your kitchen. Although the Instant Pot Max has several newer features compared to Ultra, the latter is a better option in our opinion. While the Max allows for higher pressure settings and more customizations than the Ultra, many people who used both appliances concluded that the Max is just a higher price model without many of the cooking abilities of the Ultra. Moreover, having the pre-programmed cooking modes of the Ultra, a user removes the complexity and hustle of customizing the cooking process, thus preparing meals easier. Our recommendation between the two models is the IP Ultra 60 (6 Quart) Appliance.